An oscillating conveyor shall transport and dry bulk material in the chemical industry. In prototype tests, fatigue failures occurred at the pedestal bearing of the driving motor and in the surrounding of the power transmission from the connecting rods to the feeding trays. Additionally, the conveying speed of the bulk material was unevenly distributed. 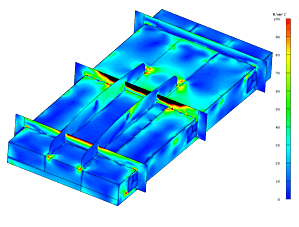 For optimizing the oscillating conveyor a detailed FEA model was created as shown in the top figure. 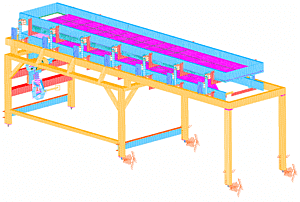 In addition to the feeding trays, this FEA model considers also the support frame and the motor mounts as elastic structures. The numerical modal analysis of the prototype design showed, that the main resonance in the projected speed range was caused by the support frame. By suitable stiffening measures of the support frame, this resonance frequency could be raised well above the maximum operating frequency. The operational stability analysis of the prototype showed significantly increased stress in the surrounding of the power transmission to the feeding trays as shown in the mid figure. The avoidance of the frame resonance leads already to a reduction of the stress level at the feeding trays. In combination with local stiffening measures in order to equalize the power transmission from the connecting rods to the feeding trays, the local stress level could be reduced by a factor of 4 as shown in the bottom figure. Similarly the local stress at the pedestal bearing of the driving motor was reduced. The operating vibration analysis shows that these optimization measures result in a more uniform distribution of the bulk material and of the conveying speed. Additionally, the conveying speed can be continuously adjusted by the operating speed of the driving motor. 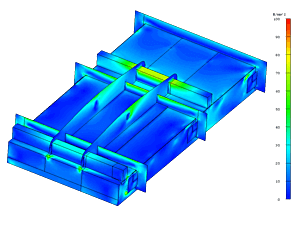 Test measurements after implementation of the optimized oscillating conveyor confirmed the results of the FEA optimization. No more cracks occurred.